At the three-quarter mark of the NFL season, there is still plenty to play for. Four teams have emerged as the most likely conference champions; the Rams and Saints in the NFC, and the Chiefs and Patriots in the AFC. The Palmerbet sports team takes a look at where the value lies in the NFL Conference Championship markets. With the Saints losing in Dallas last week, the Rams sit alone atop the NFC at 11-1. This Rams side is well and truly stacked, boasting several All-Pro talents on both sides of the ball. Offensively, they’re led by superstar Running Back Todd Gurley. Gurley has rushed for an impressive 1175 yards this season, scoring an impressive 15 touchdowns in the process. Averaging 5 yards per carry, Gurley has been immensely effective on his high volume of work this season. QB Jared Goff has also had an excellent campaign, building on his Pro-Bowl appearance in 2017. Goff has thrown 27 touchdowns this season, including 4 dimes in a primetime game against Kansas City. 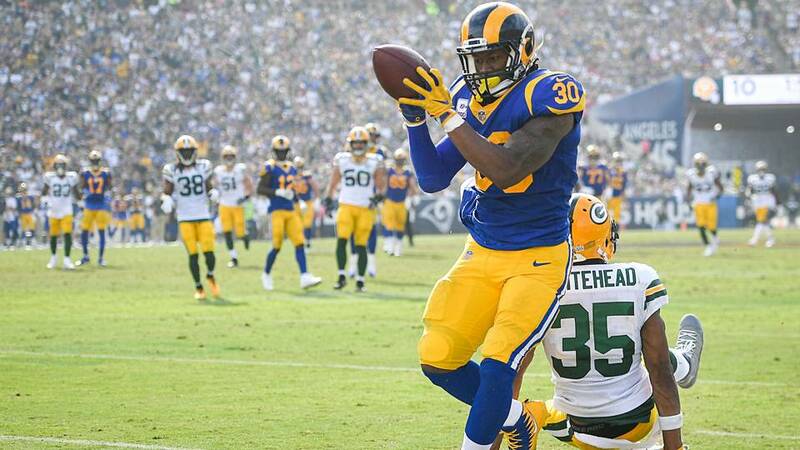 Whilst they’ve struggled defensively so far this season, the Rams boast one of the NFL’s premier defensive fronts. Defensive Tackle Aaron Donald is the current frontrunner for Defensive Player of the Year, generating an incredible 16.5 sacks from the interior. In Marcus Peters and Aqib Talib, Los Angeles also has an elite duo of starting Cornerbacks. At $2.15 to win the NFC, it’s hard to overlook this star-studded roster. As impressive as the Rams have been this season, the Saints have been just as good. After a poor opening day loss to the Buccaneers, the Saints rattled off 10 consecutive victories, including a 10-point home win over the Rams. Superstar QB Drew Brees has unsurprisingly led the way. The 39-year old has completed over 75% of his passes this season, throwing 30 touchdowns to just 3 interceptions. Sophomore Running Back Alvin Kamara has also been a huge part of the offence. An elite dual-threat back, Kamara has over 1300 yards from scrimmage to go with his 15 touchdowns. I’d be remiss not to mention the excellent contributions of third-year Wide Receiver Michael Thomas. Thomas has over 1100 yards and 8 touchdowns through 12 games, catching 87% of passes thrown his way. Whilst the Saints offence has rightfully received a lot of plaudits, the defence has also stepped up of late. In each of their last four games, this defence hasn’t allowed more than 17 points. Defensive Lineman Cameron Jordan has emerged as one of the league’s best pass rushers, already registering 10 sacks this season. Cornerback Marshon Lattimore is just as good on the back-end, regularly shutting down the opposition’s #1 receiver. At $2.50, the Saints are still well in contention to take out the NFC. In a competitive NFC race, I have to favour the Rams here. They are in pole position for the #1 seed and have a relatively easy remaining schedule. On the other hand, New Orleans have a very difficult remaining schedule. They still need to play Carolina twice and Pittsburgh once, making it difficult to win out. The #1 seed is so crucial due to the excellent home field that these two teams possess. I can’t see anyone going into Los Angeles and coming out with a win, making the Rams excellent value at $2.15 to take out the NFC. Buoyed by a fantastic start to the campaign, the Chiefs currently sit atop the AFC at 10-2. This is in large part due to their dominant offence, which has scored 30 or more points in 10 games this season. Second-year QB Patrick Mahomes has been a revelation, emerging as a frontrunner for MVP. Mahomes has thrown for over 3900 yards so far, tossing 41 touchdowns to just 10 interceptions. This wouldn’t be possible without his excellent receiving corps. Tyreek Hill has set the league alight, totalling over 1100 yards to go with his 11 touchdowns. Tight End Travis Kelce has also been phenomenal, going over 1000 yards and 9 touchdowns so far. Where the Chiefs may struggle going forward is with their rushing attack. RB Kareem Hunt was released due to a domestic violence case, meaning backup Spencer Ware will need to step up. Kansas City will also need to improve defensively. They’ve given up point totals of 54 and 33 in their past two games, an indicator of their poor pass defence. Having also conceded 43 points in New England earlier this year, you know this defence is susceptible to a good opposing offence. If they can make a few improvements going forward, this Chiefs side is a legitimate Superbowl contender. Despite currently occupying the #1 seed, the Chiefs are currently second favourite to take out the conference at $3.20. Never ones to be counted out, the Patriots have quietly had another solid season and sit at 9-3. With a relatively easy schedule the rest of the way, New England also look like a lock for at least 12 wins. In his age 41 season, Quarterback Tom Brady is having another fantastic campaign. He has already thrown for 3300 yards and 20 touchdowns, compared to just 3 interceptions. With the emergence of rookie Running Back Sony Michel, New England’s rushing attack is as good as it has been in years. James White and Rex Burkhead are excellent change-of-pace Backs that help this offence tick. The Pats will be hoping for a bit more from oft-injured Tight End and newly acquired Wide Receiver Josh Gordon. If these two can raise their level, the Pats’ offence will look dangerous come January. New England’s defence has also been much improved of late, allowing more than 17 points in only 1 of their last 5 games. This has been buoyed by an excellent pass defence that allowed only 4.6 yards per attempt from Minnesota last week. At $3 for the AFC title, the ever-reliable Brady and Belichick duo can’t be overlooked. I expect Kansas City to maintain their #1 seed in the AFC and have home field throughout the playoffs. This is extremely important due to the advantage New England has at home. Undefeated at Arrowhead this season, I can’t see another AFC team coming in and beating the Chiefs at home. Their offence is far and away the best unit in the conference and features a diverse set of playmakers. Andy Reid is also one of the best coaches in the NFL and will be desperate to win his maiden Superbowl. At $3.20, I’m more than comfortable taking KC here.